When a client has a need for a warehouse mezzanine and storage media for parts or smaller items a shelf supported mezzanine is a perfect fit. 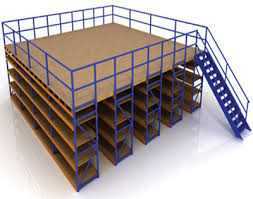 A shelf supported mezzanine can be placed on top of metal shelving, rivet shelving, or wide-span shelving. This type of warehouse mezzanine can have many different deck types, depending upon the additional square footage’s purpose. Much of the time additional shelving is placed on or extended through the mezzanine. A shelving support warehouse mezzanine is very common in automotive parts departments or in areas where more shelving space is needed than existing floor space can accommodate. For a Shelf Supported Mezzanine in Chicago, Illinois, Wisconsin, Indiana, the Mid-West states CSI is your logical choice. Hallowell ia an exceptional manufacturer of Shelf Supported Mezzanines and is who we most commonly utilize. Shelf Supported Mezzanines are engineered structures. Contact us and get the process started. CSI provides a shelving supported warehouse mezzanine when a client needs additional economical square footage and has or needs shelving for storage of parts or smaller items. IF YOU DO NOT SEE SPECIFICALLY WHAT YOU ARE LOOKING FOR, Contact us. We offer a wide variety of shelving supported warehouse mezzanines, including type of shelving, decking, railing, custom designs, designs for specific purposes, seismic, and more. Our objective is to assist you in obtaining your goals and objectives. If it is determined that a shelving supported mezzanine will not assist in achieving your objective we have several forms of mezzanines for many different objectives and environments: Structural Mezzanine, Rack Supported, Work Platforms, and more.